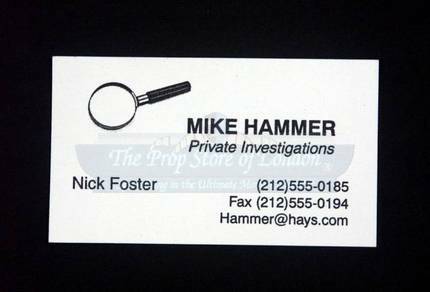 A business card for the famous private investigator Mike Hammer created by Mickey Spillane. This card was used in the production of one of the many screen appearances by the character, but we can’t be sure which one. The small cream coloured card has the character’s name printed in the middle along with ‘Private Investigations’, ‘Nick Foster’ and the address and telephone number along the bottom. Measures 9cm x 5cm (3.5" x 2").